Tuesday, December 27, 2016 - Surprise! A New Spot. The day after Christmas my wife Jane and I were at her mother Lucille’s house for her famous Minnesota Walleye dinner. So yummy! Sometime after dinner, I received a call from the oncologist informing me that the results from the recent CT Scan showed a new spot on my liver. He called to let me know which allowed me time to prepare for our upcoming appointment which was on Thursday that week. 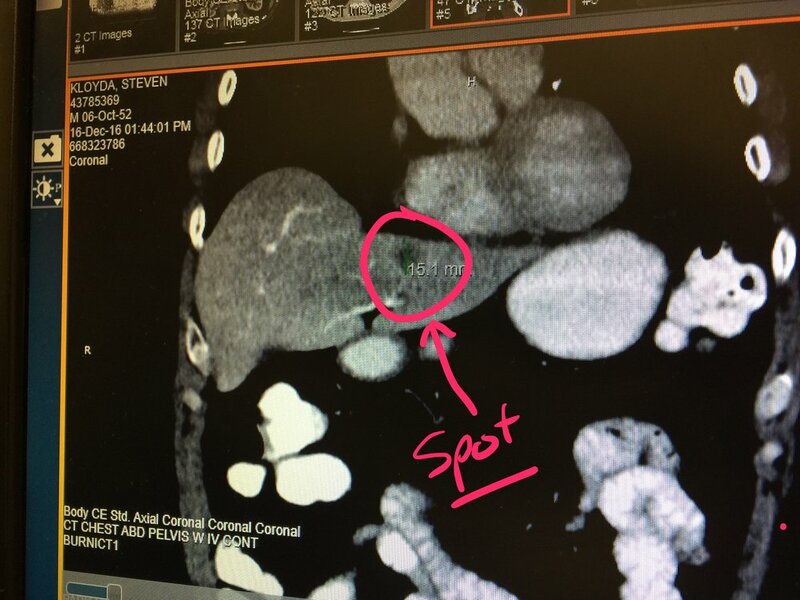 So Jane and I met with him and received a picture of the scan along with a referral to a liver specialist at Virgina Piper Cancer Institute at Abbott Northwestern Hospital in Minneapolis, Minnesota. The appointment was scheduled for Monday, January 9th, 2017 and off we went. Stay tuned! P.S. Oh! One more thing, the next day after my appointment with the oncologist I was scheduled to have surgery for a hernia that had developed over the past 30 days. Go figure. None of this makes any sense at all. The following day I had the surgery which was successful. The recovery process was much shorter. Seven to 10 days and off we went into the new year.